“Listen! Your brother’s blood cries out to me from the ground”. God addresses Cain about the death of his brother (Genesis 4:10b). Listen! The blood of the First Nations Peoples of this land cries out from the ground to the Creator God. Sally Morgan painted the above work for the book One Blood by John Harris (1990). When Rev John G. Fee in the 1800s made this his driving force he stood counterculturally against the culture and beliefs of his day that saw the enslaved African Americans as less than human. How does this truth speak of our walking in the light together as First and Second Peoples? 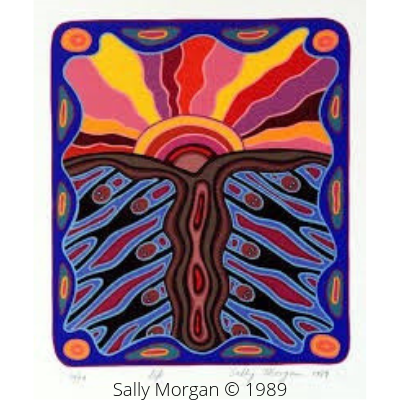 What do you see in Sally Morgan’s painting? In the Uniting Church in Australia, when we advocate for refugees and in the march on Palm Sunday, our Christian belief is: “God created humankind in his image, in the image of God he (sic) created them” (Genesis 1:27a). I’m sure you have heard it said we are ‘image bearers’ and so we are, but the truth of the Acts verse above is that we are “of one blood”- all humanity blood sisters and brothers. “Without the shedding of blood there is no forgiveness” (Hebrews 9:22b). It’s Holy Week, the Cross of Christ looms large for us as Christians. The shedding of blood is significant in many cultures just as it was for the Hebrew people. “The painting also depicts the sacred ground where ceremonies take place and in particular the Wukindi ceremony, to restore relationship when blood is spilt and bring reconciliation”. This sacred painting given at the time in 1994 when the Covenant between the Uniting Church in Australia and the Uniting Aboriginal and Islander Christian Congress was formalised, is deeply spiritual and significant for the Dhurili Riŋgitj (an alliance of four Yolŋu Clan-Nations). My friends, I ask us all this Holy Week to enter into a deep period of self-reflection and introspection. For it is my firm belief, that our Creator God who has led us in covenant relationship, would heal our land and her people, all her people, for we are of one blood.